Magna says production of full-scale prototype door assemblies and performance and safety tests are next on the list. DETROIT -- Canadian auto parts manufacturer Magna International created a vehicle door that is almost half the weight of the average door, the supplier said Monday at the Detroit auto show. Magna says the door, which attained 42.5 per cent mass savings compared to the average vehicle door, was developed in partnership with Spanish supplier Grupo Antolin and Fiat Chrysler Automobiles. The design was part of a project funded by the U.S. Department of Energy, which set the project criteria and door-weight target. Ian Simmons, vice president of business development for Magna’s corporate engineering and r&d department, told journalists after Magna’s press conference the door will be ready for production in three to four years. He said the entirely new architecture can go into current vehicles or new-model introductions. Simmons said the technology can apply to 70 per cent of the light-vehicle market and is not limited to FCA vehicles. “We’ve not set ourselves any limits in terms of who we’re going to talk to…So far we don’t see anything that constrains us from working for most people,” Simmons said. 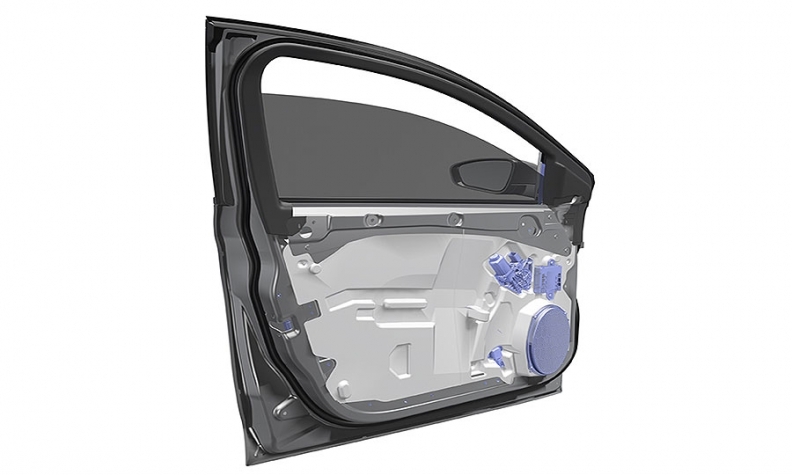 Magna went “back to the basics” of physics and geometry in constructing the door, Simmons said, and made it “intensively aluminum.” The supplier also added its SmartLatch, an electronic side-door latch which saves weight and reduces required components. The Magna release said Grupo Antolin’s interior molding technologies and polymers in its interior trim components contributed to about seven per cent of total mass reduction. Magna has been working with FCA engineers on design elements and prototype testing. The supplier says production of full-scale prototype door assemblies and performance and safety tests are next on the list. In its release, Magna pointed to its previous experience with the Department of Energy and Ford Motor Co. in 2014 called the “Multi-Material Lightweight Vehicle,” which assessed how to design a lighter vehicle based on individual parts. At the press conference, Simmons said the reduced weight of the new door architecture could reduce fuel usage, further reducing emissions. Magna is headquartered near Toronto. It ranks No. 3 on Automotive News’ list of top global suppliers with worldwide automotive parts sales of US$32 billion in 2015.